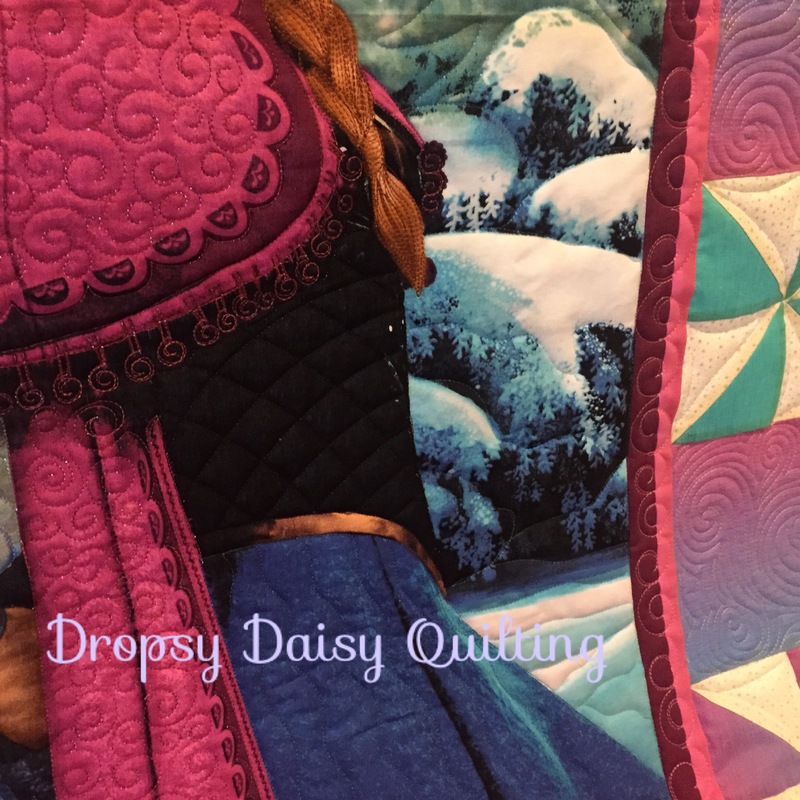 Dropsy Daisy Quilting ~ APQS Sales Rep | "Adding drops of magic to your quilt"
"Adding drops of magic to your quilt"
This girl was SO much fun to quilt. There is around 25 hours put on this little lady. 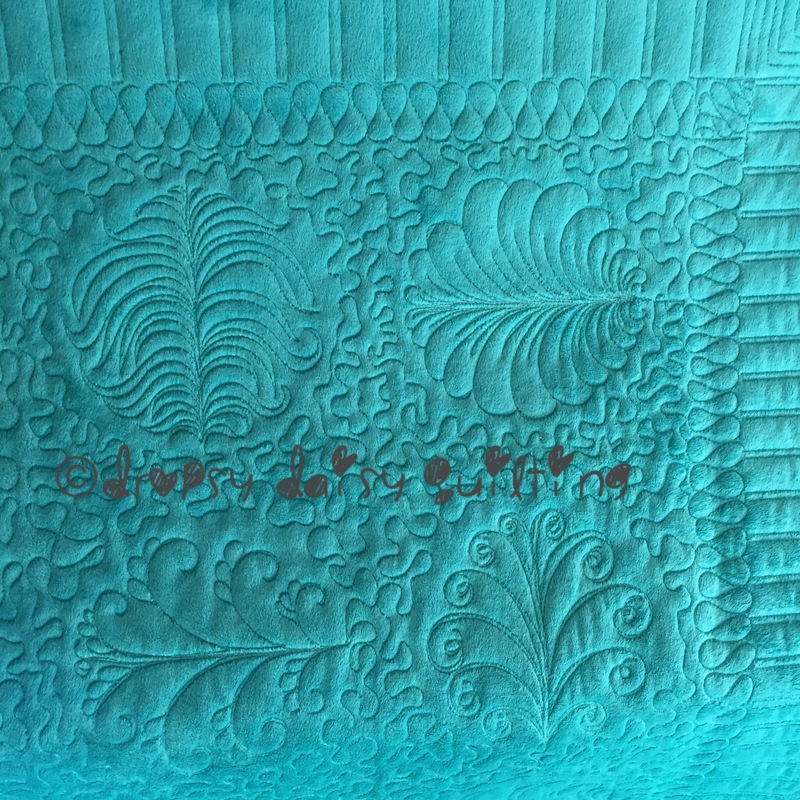 She was pieced with a mixture of Kaffe Fasset fabrics, batiks and other cottons so I had a beautiful canvas to start with. 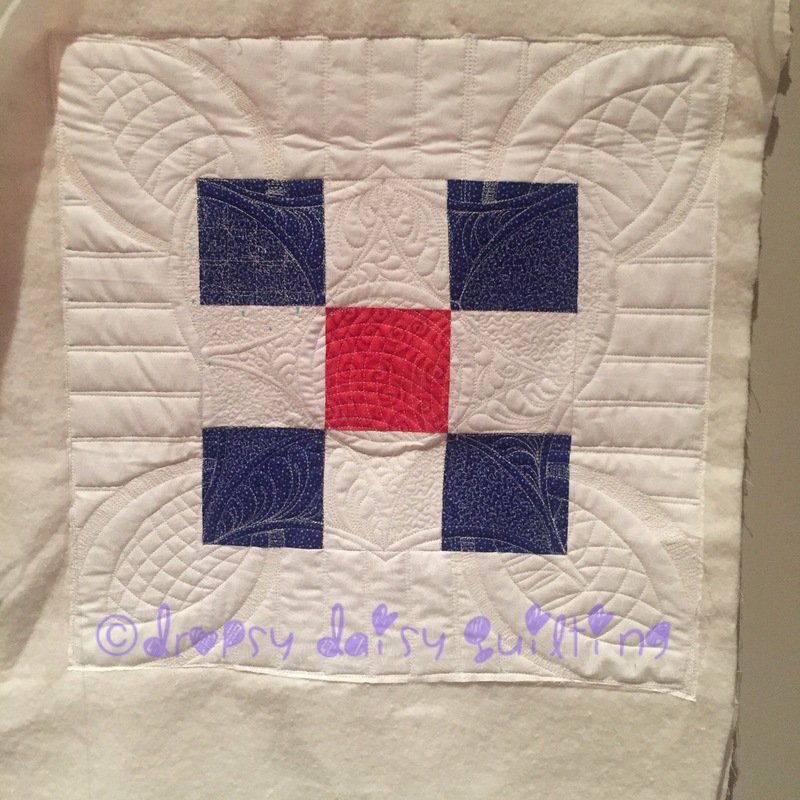 When I quilt, I like to do all that I can in each pass. I really try to avoid having to go back and do large areas. Ellie was no different. I did a combination of free motion and ruler work on her. 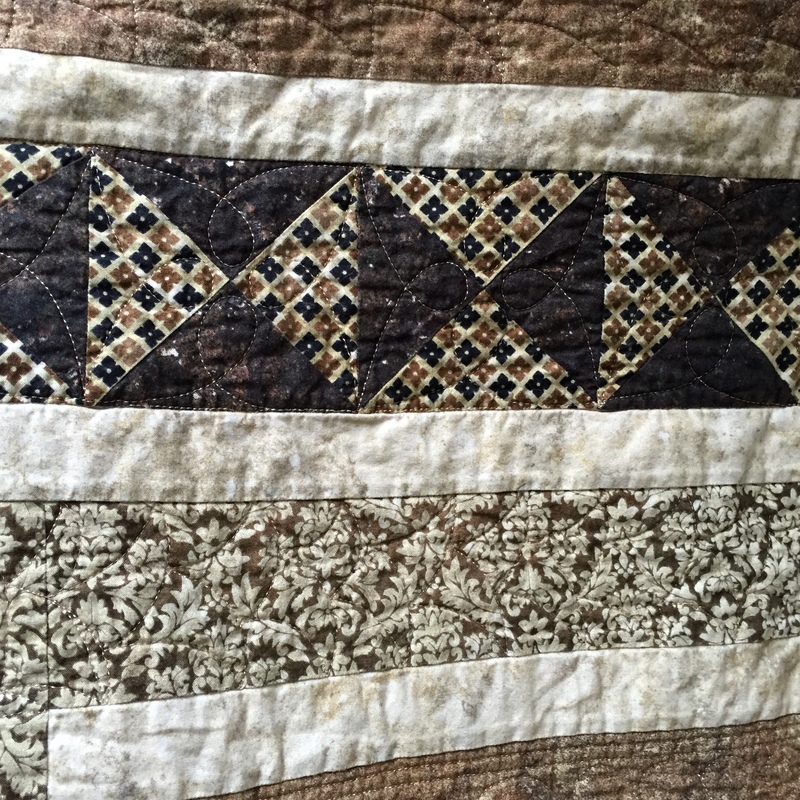 Each piece of her was stitched in the ditch and then a design added to the area. In the background, I took inspiration from Sharon Blackmore and did a large curl design and added in the fill after. So much awesome negative space to play with. I had a lot of fun with Ellie and I’m so excited for her to make it back to her owner this week. Pictures just never do the actual piece justice. 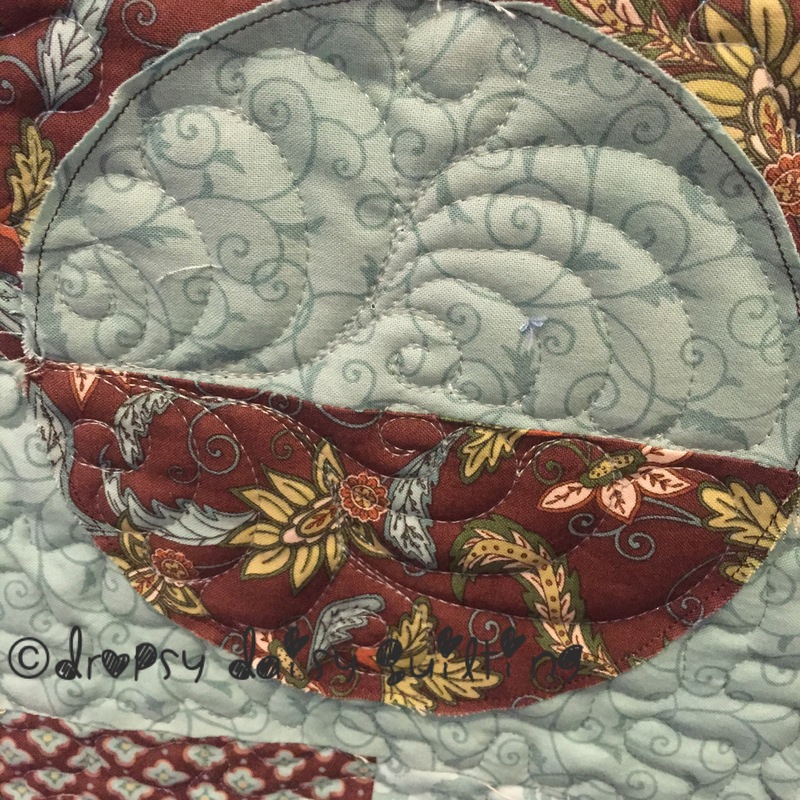 One of my favorite parts of this quilt is Ellie’s toes. 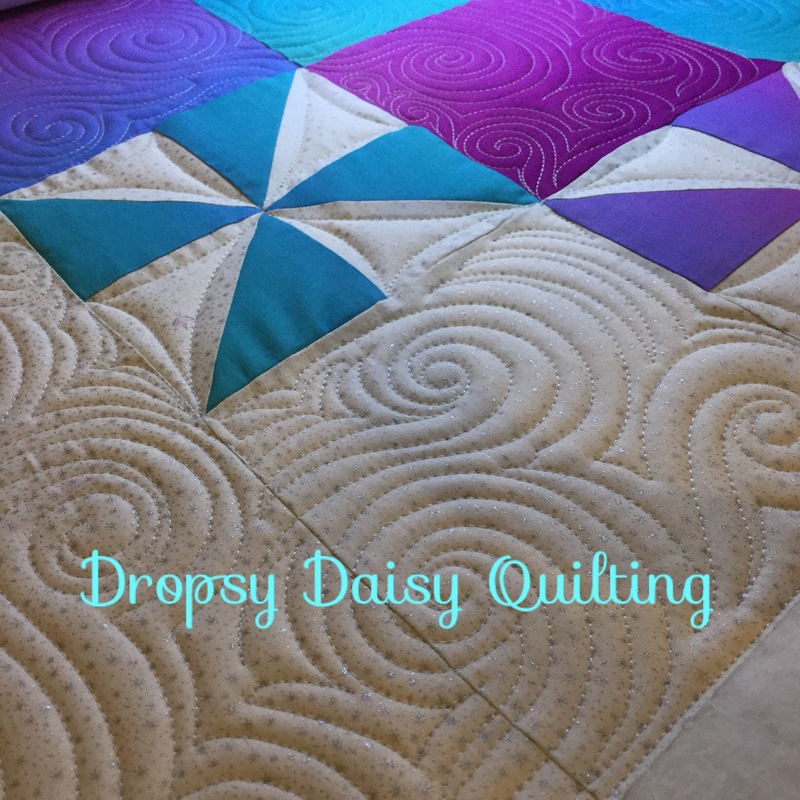 Throughout the quilting process I tossed around several ideas on how to quilt them…then as I got closer to that point it came to me and I did a happy dance when they were done. 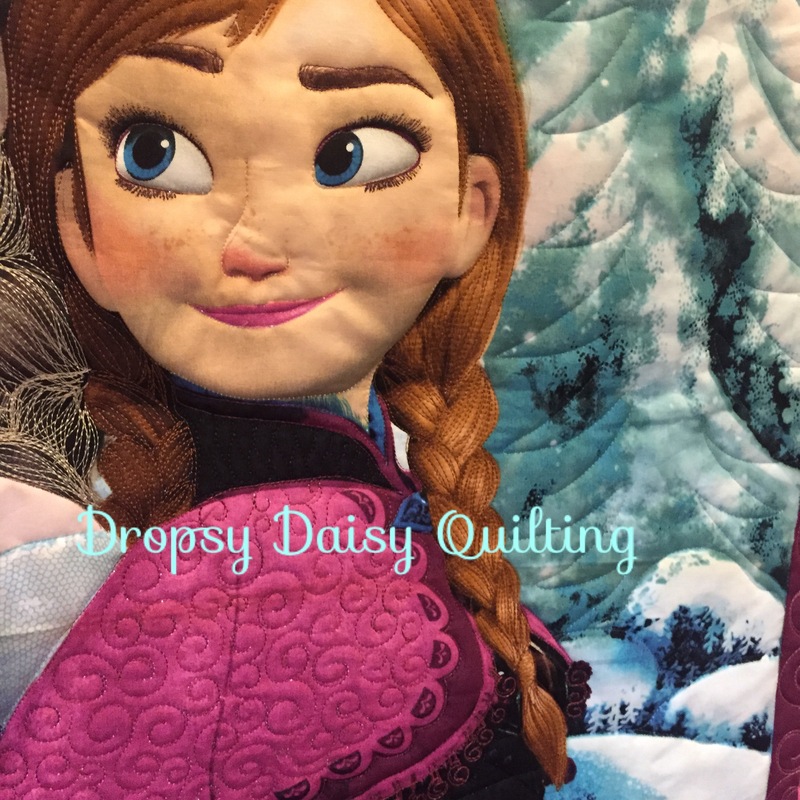 Her owner will be blinging those toes out…as well as the whole quilt. I cannot wait to see Ellie complete! I am proud to announce that we are now offering a rental longarm service!! You will start off by taking a certification class. During this class I will teach you how to load your quilt, get a pantograph started and run Lucey. 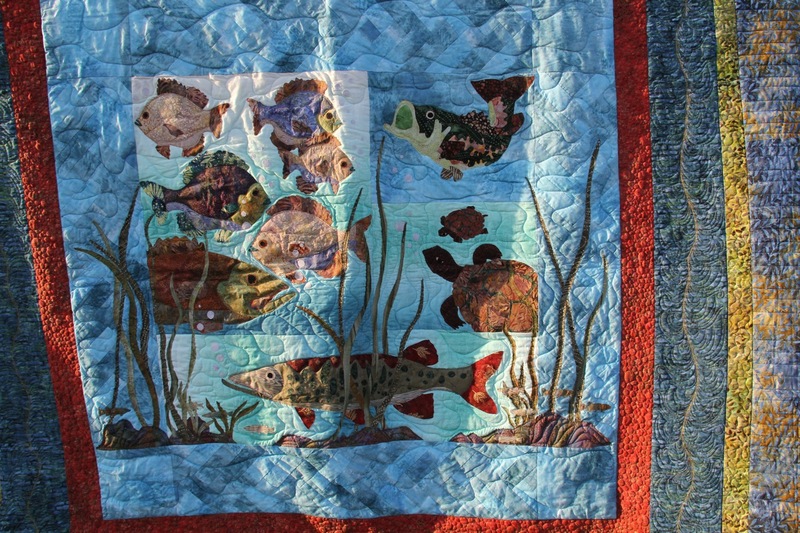 During this class you will finish one of your own quilts (60×60). If you bring a larger quilt and stay longer than the class time allotted you can pay by the hour for the time you go over. 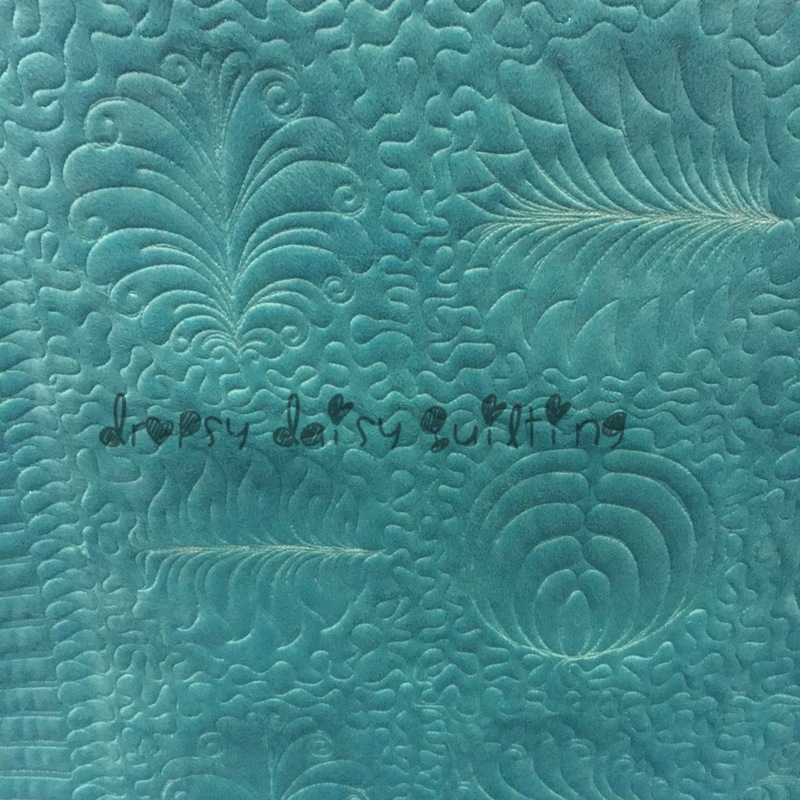 After you have been certified you can book your appointments and come in and finish your quilts. I will be there to help when needed. 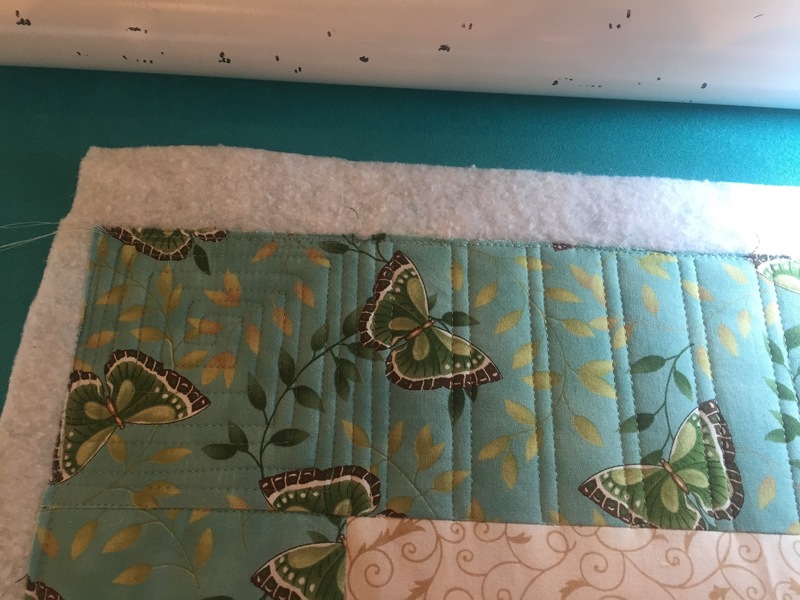 Pricing will be under the longarm rental tab up top. 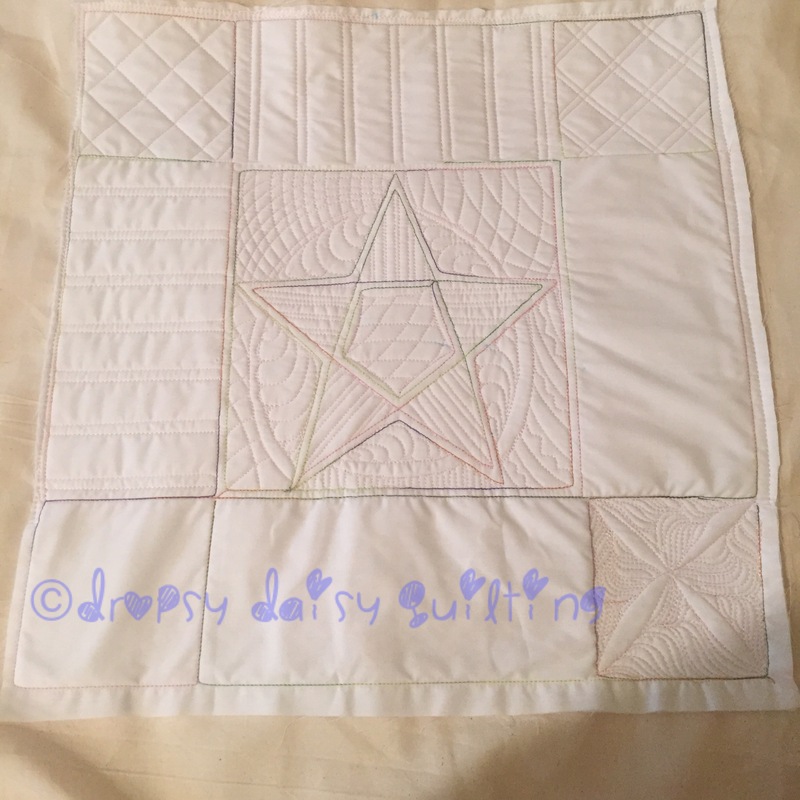 This quilt is the VERY first kit I bought when I started quilting. I fell in love with the colours and the fabric line. So I started it..cut my fabric, sewed the squares together and cut out a few circles with scissors. I then discovered the cool Olfa cutter for cutting cirlcles. It’s like a compass. I bought it and then put it all in a container and to the side….for about 5 or so years! 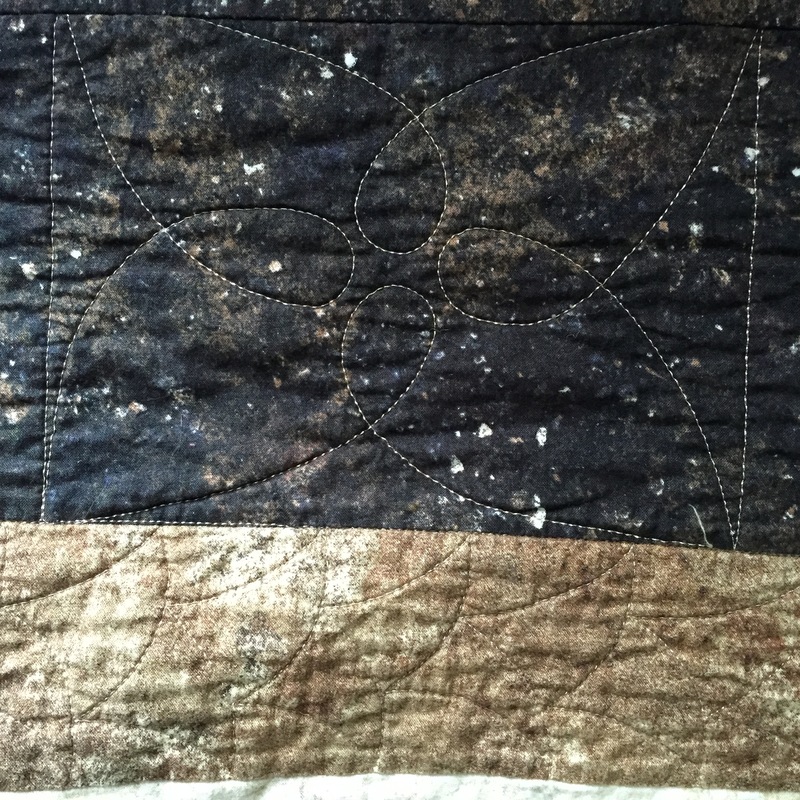 This last year I have pulled it out 3 times and tried to do it but got sidetracked just like five years ago with the fairy quilt I made for my mom. So this summer while visiting family I brought along my sewing projects to get some piecing done. I don’t have a lot of piecing time these days so this worked out perfect. 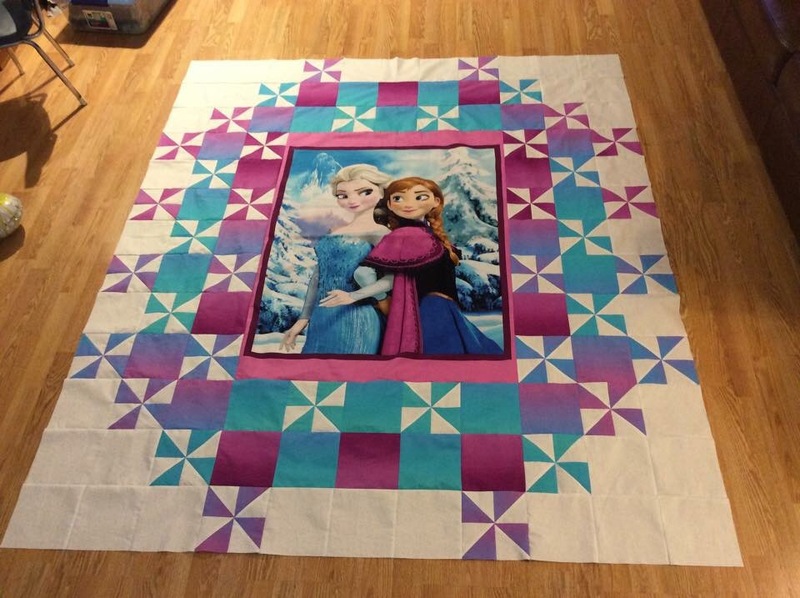 This quilt went together so fast! I really don’t know why I put it off for ALL these years. 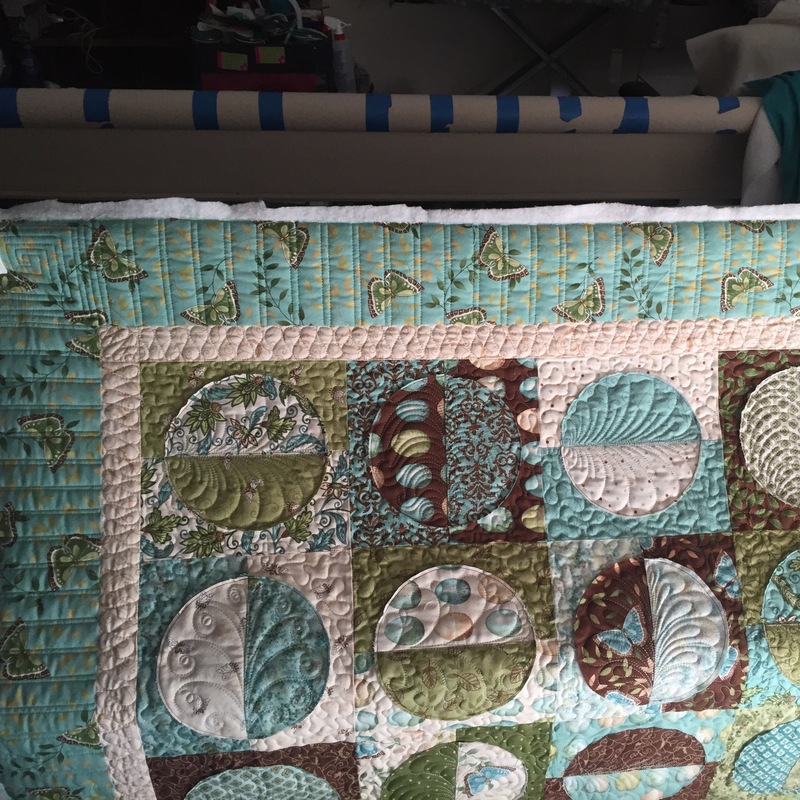 I couldn’t wait to get it on Mags and quilt her up. 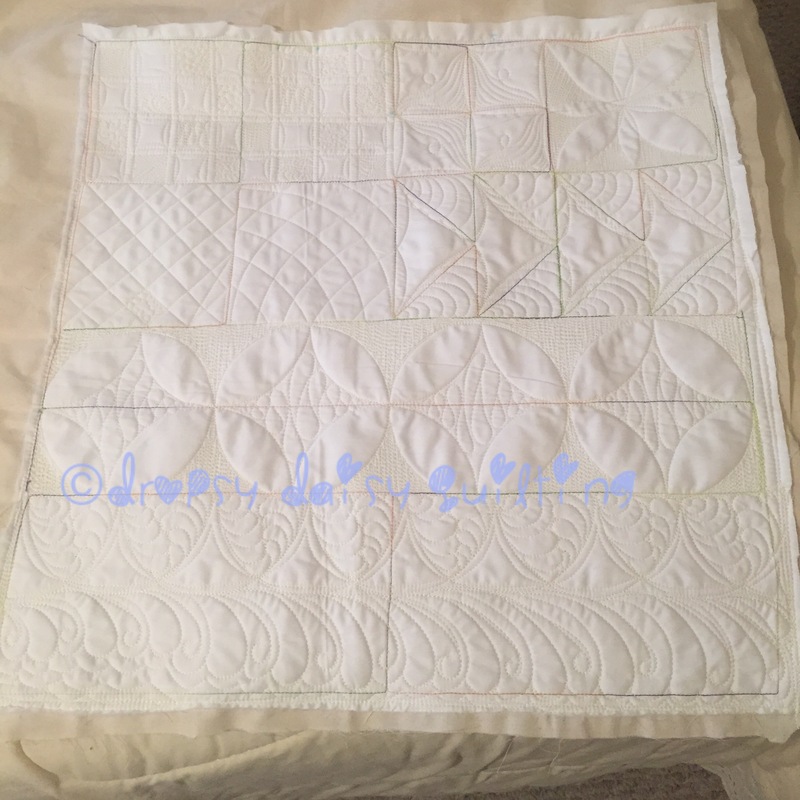 It turned out to be a baby sized quilt. I used minky for the backing so if it can find a home to a little princess it will but for now it will hang on my wall. I knew when I loaded it I wanted to play with my new rulers from Lisa Calle and I did just that. I did beadboard on the outside border with my ProLine ruler. In the corners I wanted to give the feel of crown moulding by doing the echoed square. I left the small border till the end since I wasn’t sure where I wanted to go with it. So I got to work on the body. I started off meandering around the cirlces and then when I would get the the bottom of the circle I decided the add a feather in each one. 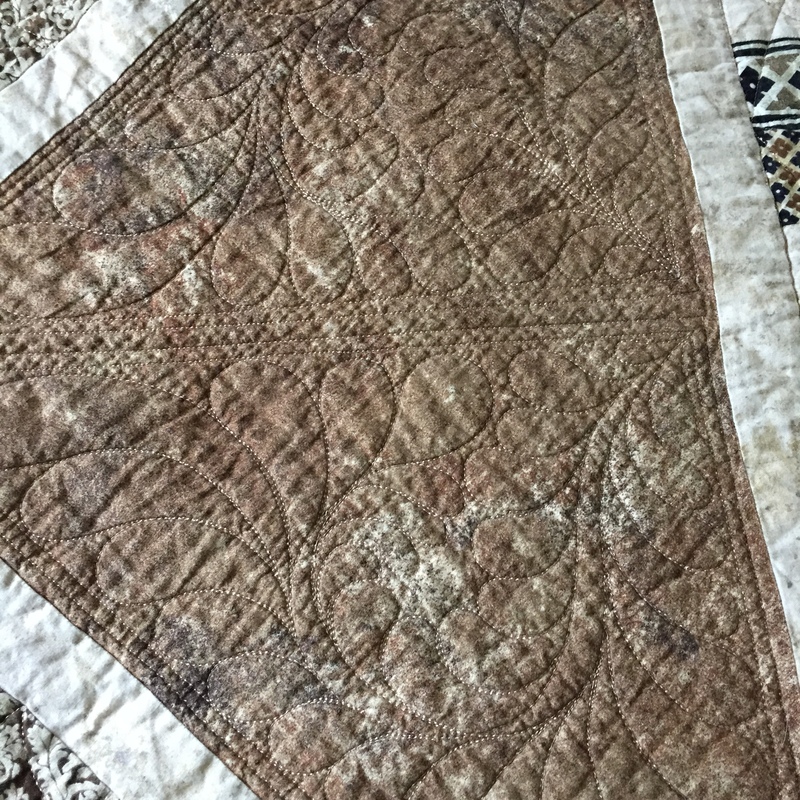 This one is a Judy Madsen design that she normally will use in triangles. I decided to try it in a circle. I loved how it came out. So in each circle I did a different feather design. It was so much fun. I really loved doing all the different designs. 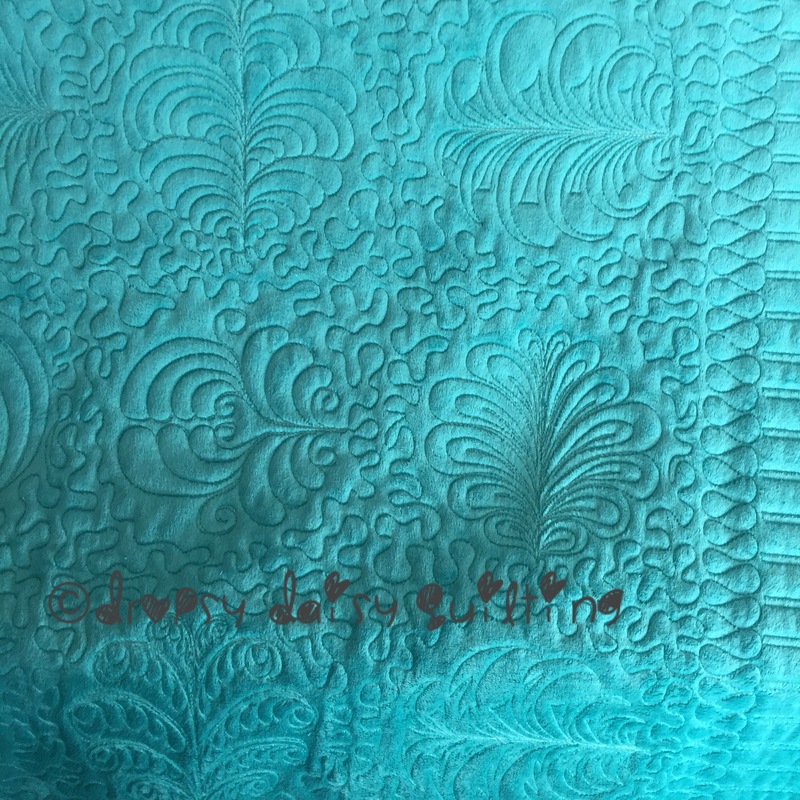 I threw in one that Tracey with Whirls ‘N Swirls Quilting did in her #fmq101 videos. I believe she called it cocoon. Here it is. Here are pics of the rest of the feathery designs…from traditional feather to leafy and funky feathers. And here’s the front of the quilt and as you can see I went with a ribbon design in the small border. Binding next and then it will hang in my studio. Have a great day everyone!! 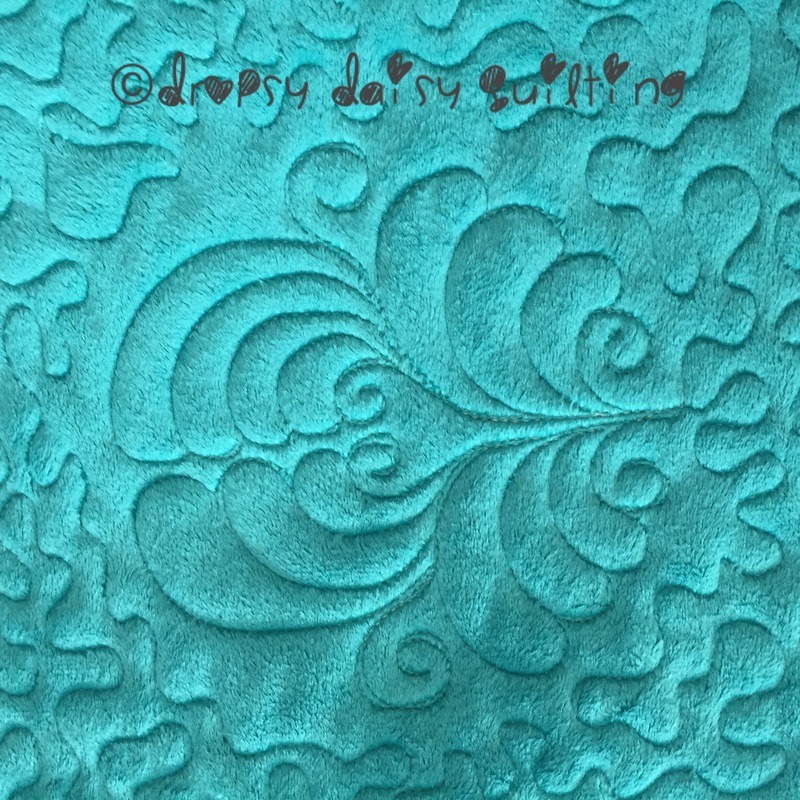 Divide…design and Rule that fabric! In the beginning of July I was lucky enough to attend Lisa Calle’s classes at Sparrow Studioz!! We spent the first day on “Totally Templates” and “Gettin in the Groove“. I loved doing all the fill work I was able to do in this class. During “Gettin’ in the Groove” we learned how to use Lisa’s rulers which I’m in love with now. They are definitely in my favourite ruler list! On the second day, we got down to business now that the basics were done. It was time to “Divide and Design“. 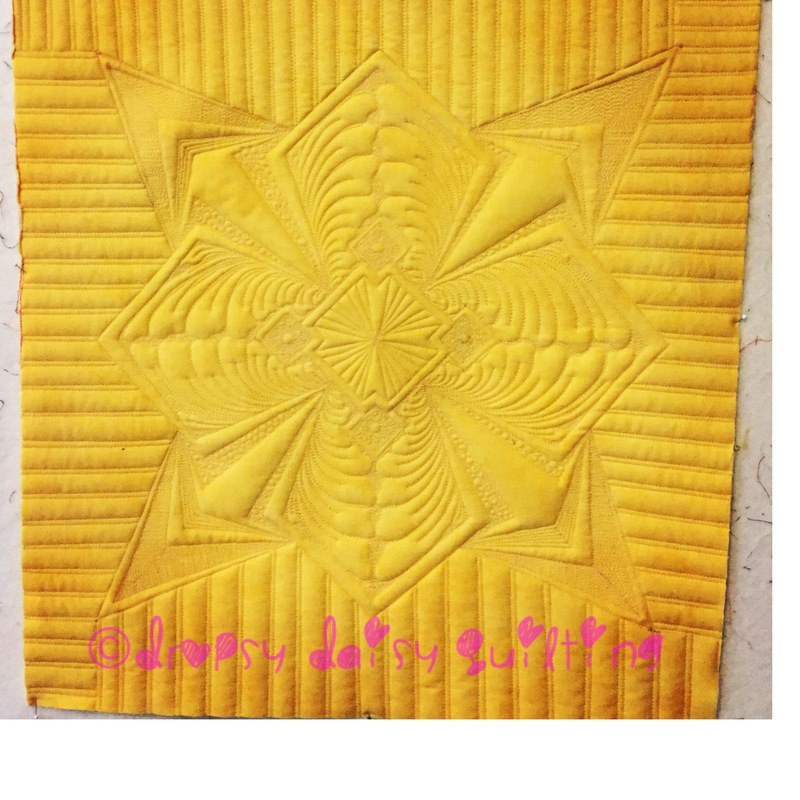 We started out by drawing out our design based on a picture of the block we were going to quilt on. We all had the same block and it was amazing at how different everyone pieces were. It’s so great taking classes and getting inspiration from each and ever person in the class. Here’s my piece that I completed in the class. I had some time after I finished my piece so I started on a new one. 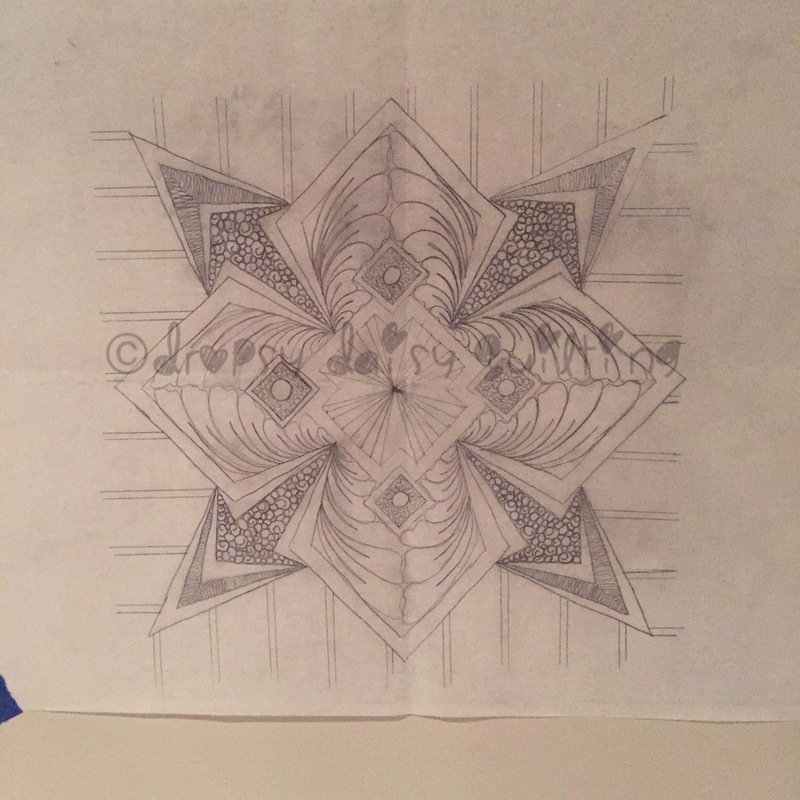 I had decided I wanted to try a geometric design this time. I drew this out and then had to wait a few weeks before I could get to my machine to stitch it out. Love love love how it came out. It just needs some binding and some bling. I encourage anyone who has the chance to take Lisa’s classes. She’s a fantastic teacher and human being as well. She makes you feel comfortable and very encouraging and helpful. 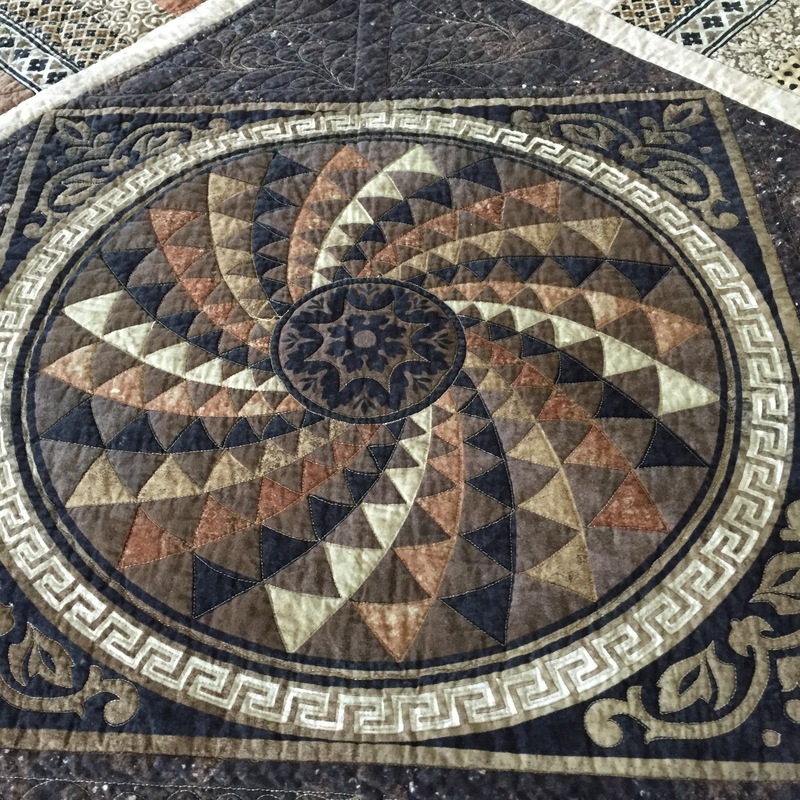 Thank you Lisa for coming to Canada even though there was an issue with your quilts not making it to the studio. Let it goooo…let it gooooo! Can you guess what I’m going to talk about today??? 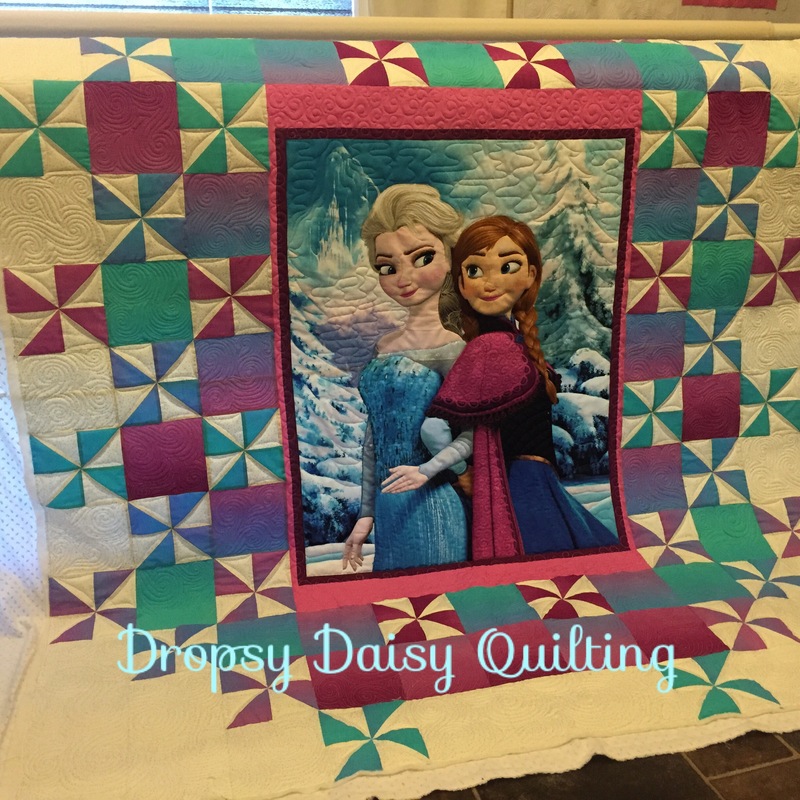 A few weeks ago my client brought me 2 absolutely gorgeous frozen quilts. When she initially showed me the picture I got so excited. So much potential. 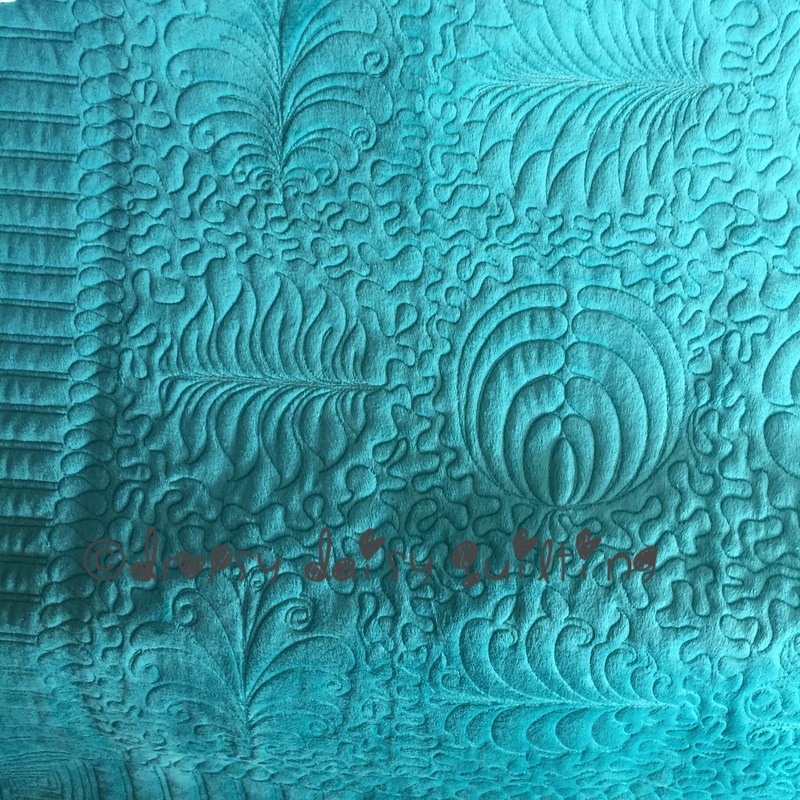 Btw, I really need some of this ombré fabric! I love it. I decided it would be fun to make the solid blocks look like the wind was flowing and have the pinwheels feel like they were spinning. Once I had the complete outside of the panel done I went to work on the inside to bring out the details of the girls. Weird as it sounds my favourite part of this was their noses. 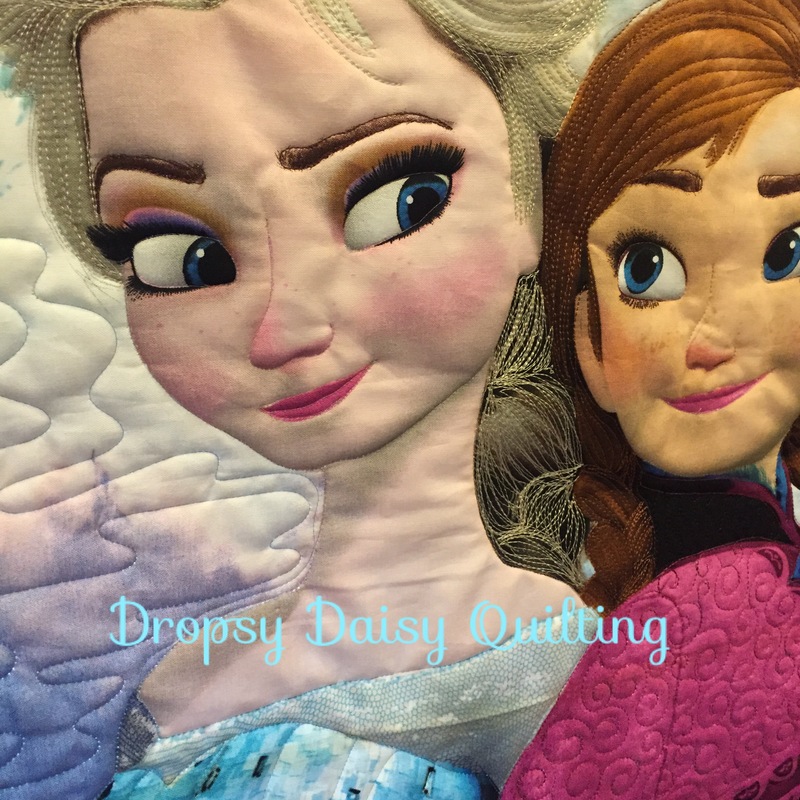 It seemed to just bring them to life when I stitched their noses. I did their eyes, eyebrows and mouths as well. I also did some thread painting on their hair. It’s amazing how adding these touches bring the panel to life. I really had fun with their dresses especially Anna. I did curls in her cloak and a cross hatch on her bodice. 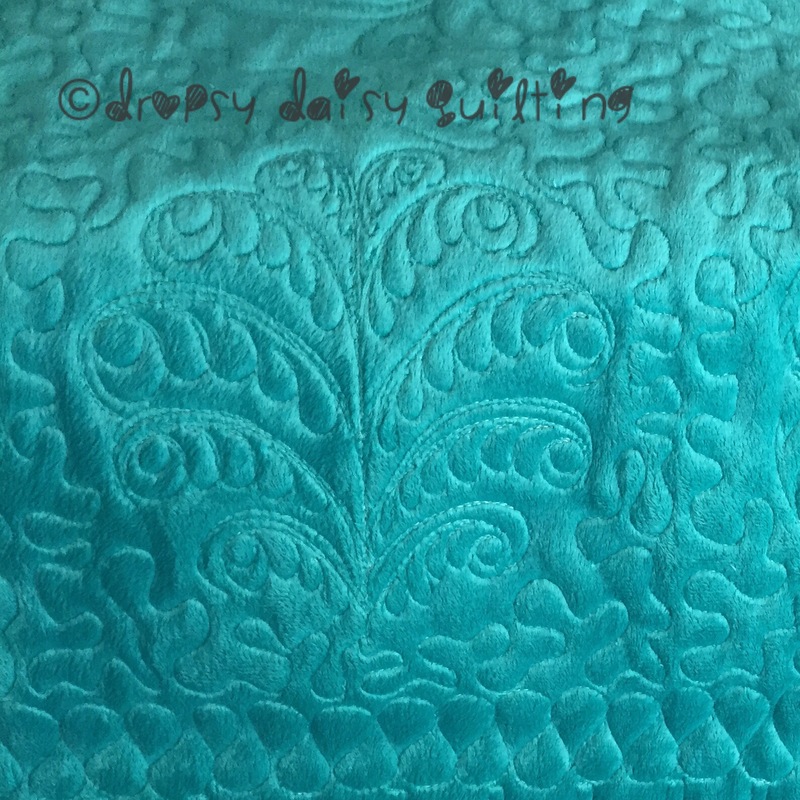 I took a lot of induration from a fb page in on where we give feed back on how would you quilt it. 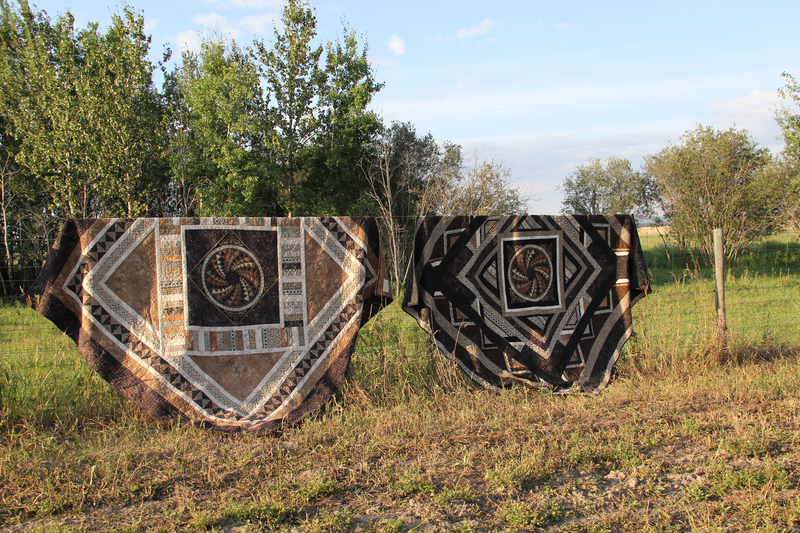 And here are the finished quilts. My client is going bling it up too. It’s going to be gorgeous and her grand daughters are going to be so in love! Now to compete the one I have for my youngest Daisy. Shes’s tried to claim these quilts a hundred times. Lol. 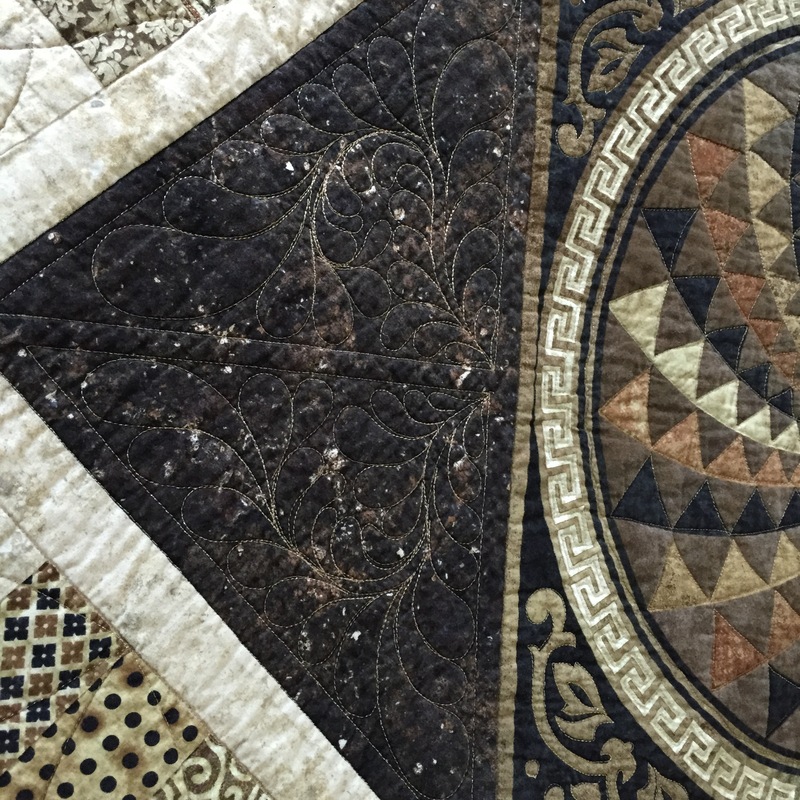 Here’s a quilt I pieced and quilted last year for a client. It’s Mckenna Ryan’s “Something Fishy”. 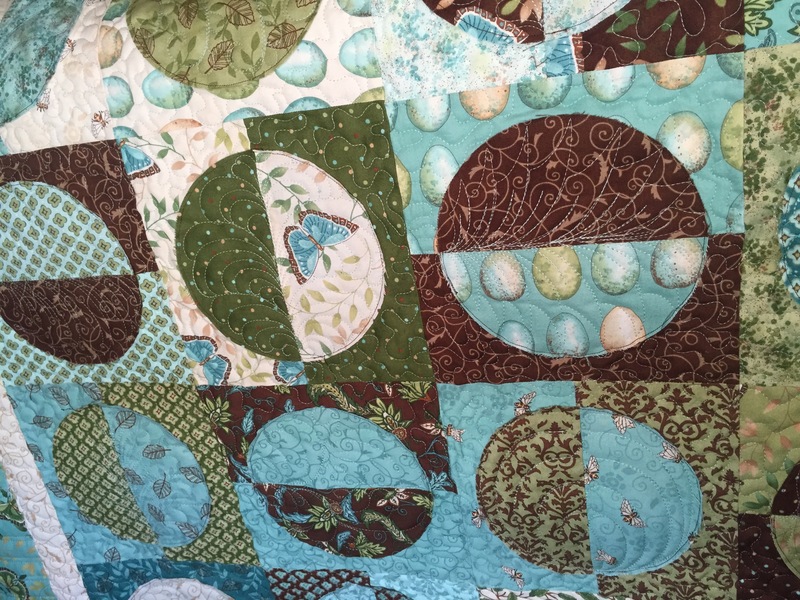 It was quite a fun quilt to do. I think what made it even better was the batiks. 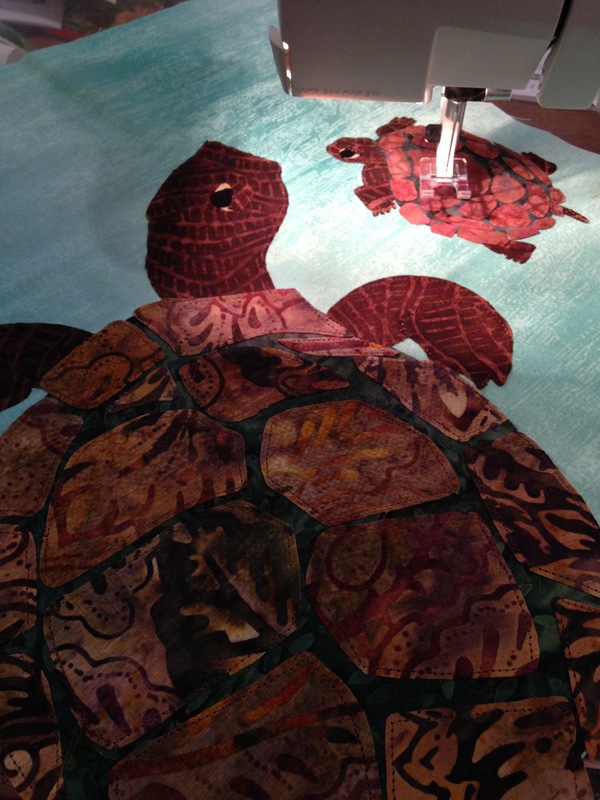 I just love batiks! For this one I enlisted the help of my trusty Brother Scan and Cut. I bought it especially for this quilt because I’m pretty sure I would have ended up in 5 south rocking back and forth had I cut all of these pieces by hand. The back. I love looking at the back especially on minky! 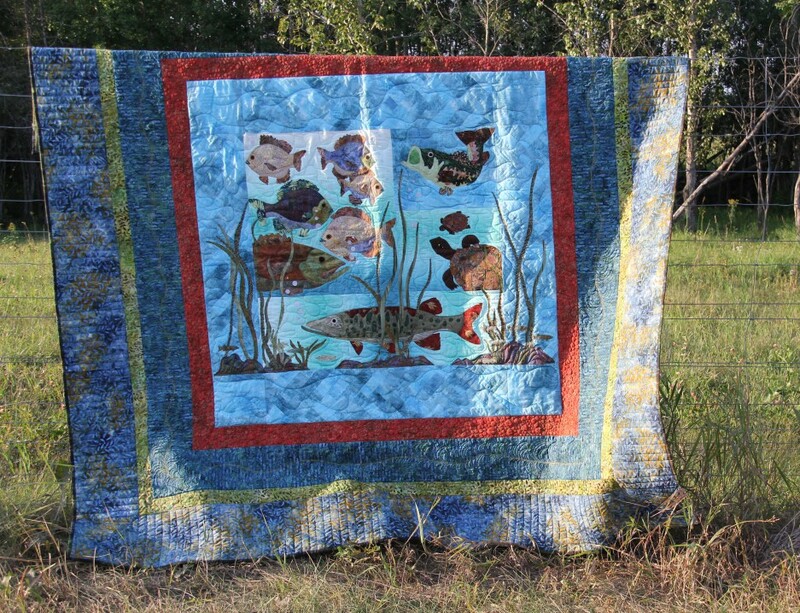 The gentlemen this quilt was gifted to loves fishing. 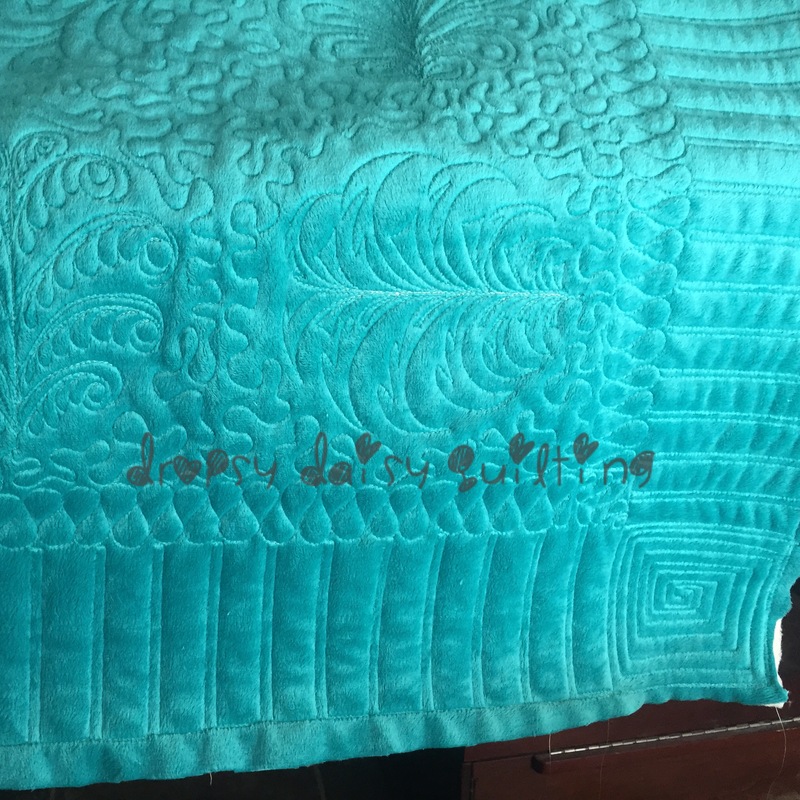 I was able to be there when he was given the quilt and he was speechless. He stood there staring at it for a long time as well as several times after we had left. I love the joy of giving…watching someone receive something that they will treasure for the rest of their lives. Let’s CHALLENGE each other she says….or maybe I said it.. 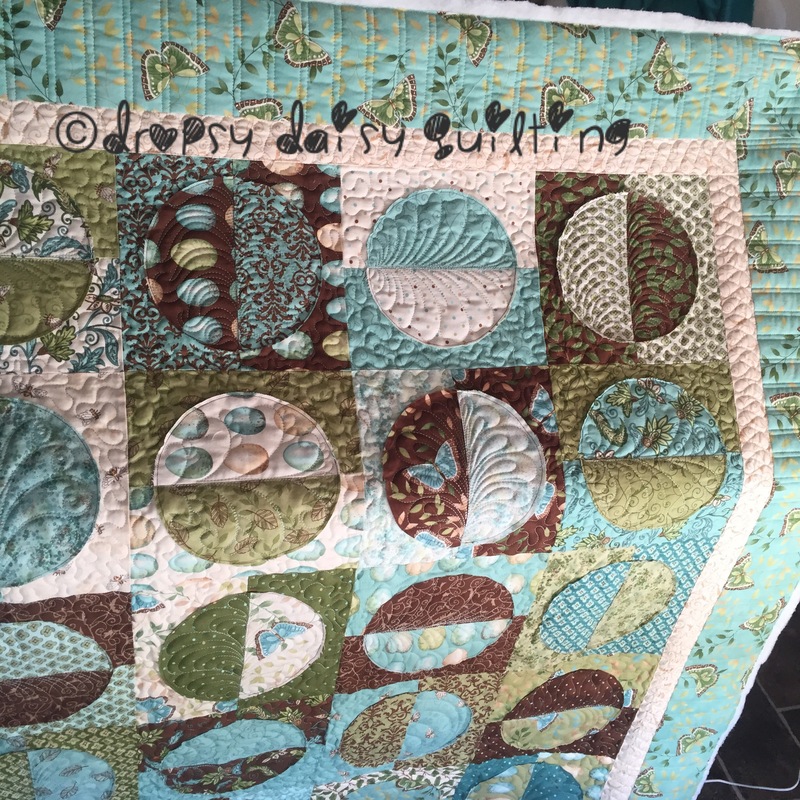 CHALLENGE: To each buy the panel and some of the same fabrics from the line and then create a quilt from them all WITHOUT TALKING TO EACH OTHER! PS. we could add in some fabrics from our stash as well. So after 4 long months we set a date for the reveal. I can’t even describe how relieved we both were for that day. When we showed each other it was truly amazing how different each were even though we had a lot of the same fabrics. Night and Day…quite literally. Mine is on the lighter end of the spectrum and Wifey’s is on the darker end. 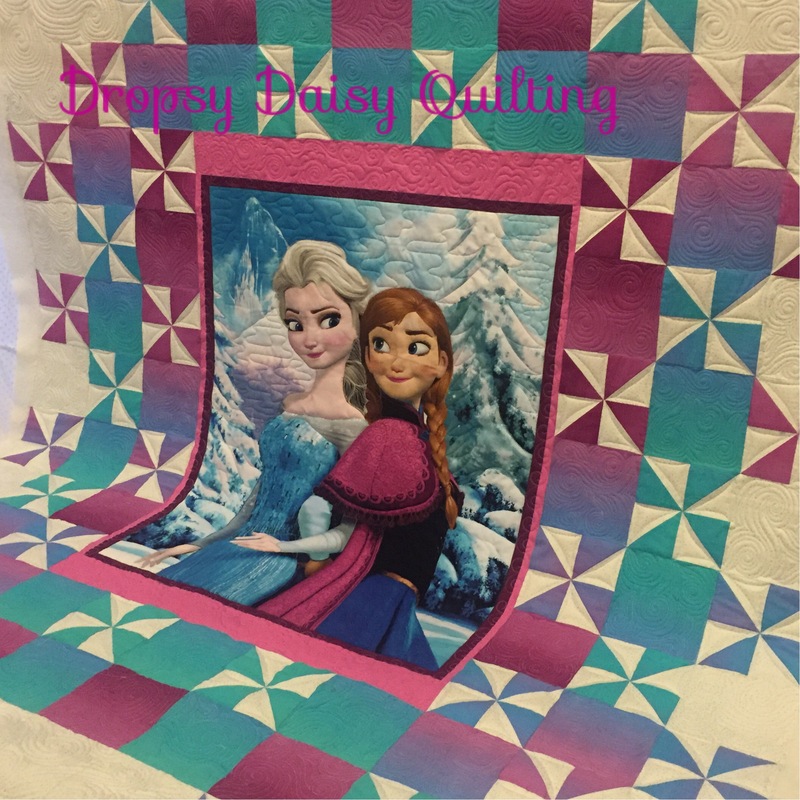 We took them to Matt Sparrow of Sparrow Studioz to quilt them. He had free reign on them. 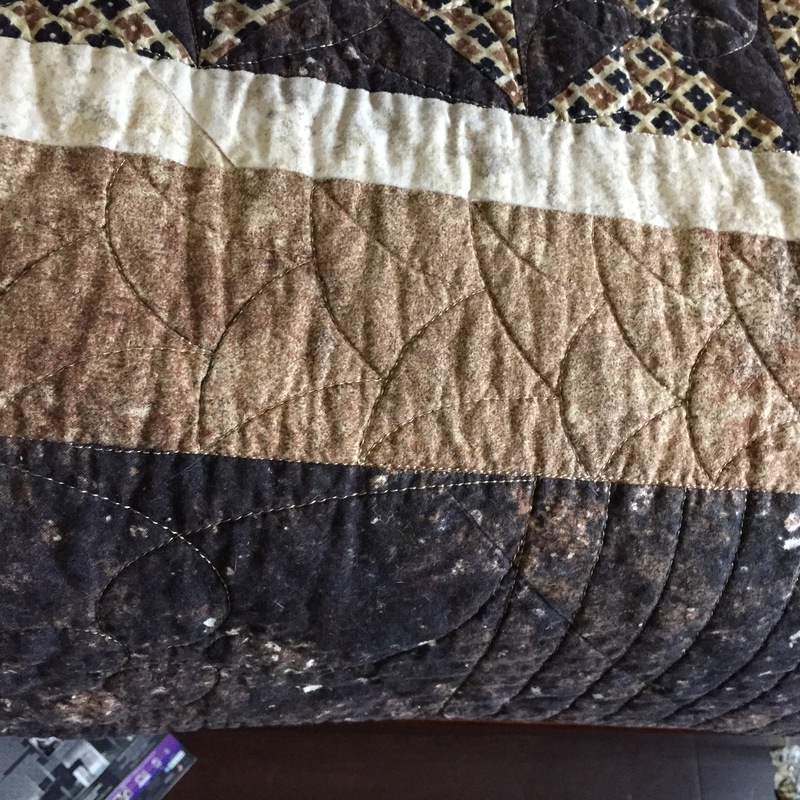 I don’t have any close ups of Wifey’s quilt…maybe I can get her to send some soon and I can update with them. 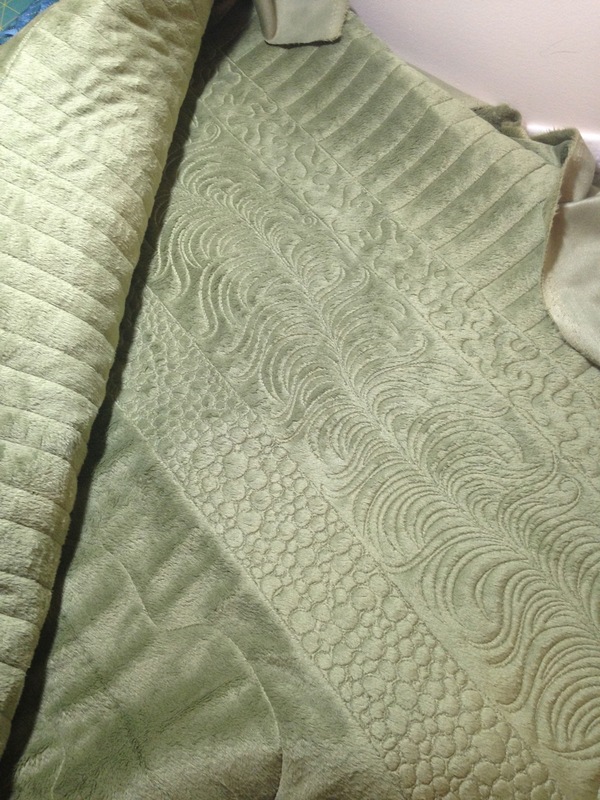 Matt did a fabulous job on both quilts. He also lovingly named them “Big A$$ Stonehenge”. Made me laugh when I saw that!! Even though I didn’t quilt either of these I just had to share the craziness we put ourselves through. It was crazy fun and the results were awesome!!! 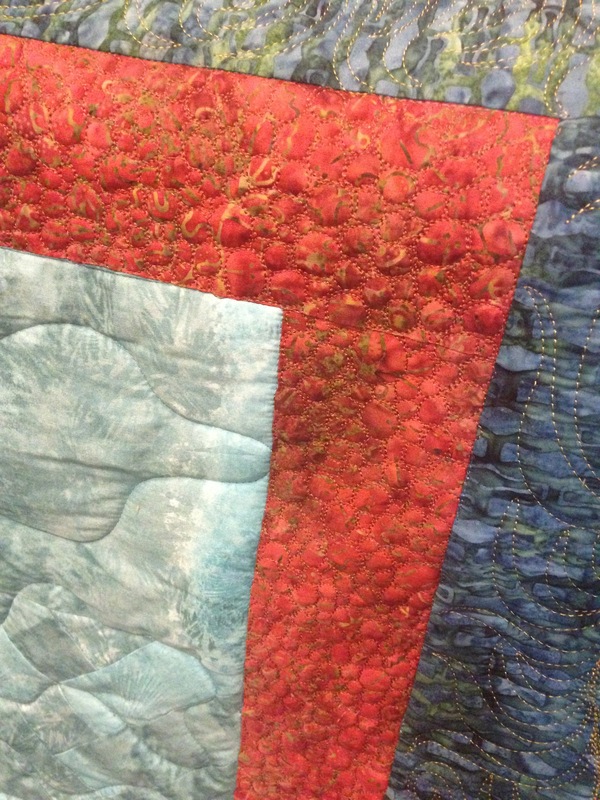 Here are some close ups from my quilt.